Piper claims, wrongly, that the apostle Paul uses the phrase, ‘the glory of the happy God’, because it is a glorious thing for God to be as happy as he is. ‘God’s glory consists much in the fact that he is happy beyond our wildest imagination… It is good news that God is gloriously happy. No one would want to spend eternity with an unhappy God’ (The Pleasures of God, p23). ‘But God’s saving designs are penultimate, not ultimate. Redemption, salvation, and restoration are not God’s ultimate goal. These He performs for the sake of something greater; namely, the enjoyment He has in glorifying Himself. The bedrock foundation of Christian Hedonism is not God’s allegiance to us, but to Himself (my emphasis, DG, p31). In the previous article we saw that Piper’s attempt to use Psalm 115 to support his idea of a happy God was unsound, for the psalm in no way supports Piper’s argument. The basis of salvation is the divine love of God which took the initiative to seek out the lost by sending Jesus Christ. When God created humanity, He imprinted upon our being the likeness of Himself (Genesis 1:27). In addition, God places within those who He has saved His own Holy Spirit (John 16.7-15; 17.20-26). Therefore, God loves himself in us. Those who are elected unto salvation receive that which never originated in them, but is freely given because of God’s elective purposes. God’s love is the fullness of His affections set upon the elect and realized through the new birth. Furthermore, by giving to His children the glory of His Son, God proves the point that He has an unselfish concern for His own glory (Millard J. Erickson. Christian Theology, 2nd ed, p319-20). The words of Jesus make it clear that God will give to those who believe in His name the glory of His own Son. Jesus said, ‘Neither pray I for these alone, but for them also which shall believe on me through their word… And the glory which thou gavest me I have given them; that they may be one, even as we are one’ (John 17.20, 22). How can God have an unselfish concern for His own glory? Primarily, God’s unselfish concern flows directly out of His immutability, sovereignty, and agape love. In addition, God’s unselfish nature does not diminish His consummate goal in creation: that He may be all in all. 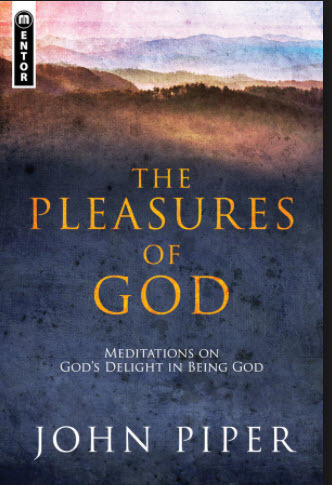 ‘the ultimate ground of Christian Hedonism is the fact that God is uppermost in His own affections: the chief end of God is to glorify God and enjoy Himself forever’ (Piper’s emphasis DG, p31). He has reworked the concept of God’s glory to mean, ‘the enjoyment He has in glorifying Himself’ (my emphasis). This statement has no biblical warrant. Piper paints the picture of a self-absorbed god whose chief attribute is happiness and whose chief end is to enjoy himself. In other words, Piper’s god is a committed hedonist. This is a false view of the God of the Bible. He is seeking to support his hedonistic cause by claiming to know the chief end of the eternal, infinite God, whose ways and thoughts are beyond human understanding. Scripture says, ‘no man can find out the work that God maketh from the beginning to the end’ (Ecclesiastes 3.11). And, ‘For what man knoweth the things of a man, save the spirit of man which is in him? even so the things of God knoweth no man, but the Spirit of God’ (1 Corinthians 2.11). Many things known to God are kept secret from man (Deuteronomy 29.29). The things revealed by God in His Word and in creation are the proper object of our enquiries, that we may know our duty and be kept from useless speculation about the secret things of God, such as the ‘chief end of God’, which is not revealed to mankind. Piper’s statement about the chief end of God is misleading and heretical. ‘My conclusion is that God’s own glory is uppermost in his own affections. In everything he does his purpose is to preserve and display that glory. To say that His own glory is uppermost in His own affections means that he puts a greater value on it than on anything else. He delights in his glory above all things’ (my emphasis, DG, p42) Piper goes on, ‘God’s ultimate goal is to preserve and display His infinite and awesome greatness and worth, that is, His glory’ (DG, p42) God’s glory ‘is clearly the uppermost reality in His affections. He loves Himself infinitely’ (DG, p43). And more, ‘This is why God has done all things from creation to consummation for the preservation and display of his glory. All his works are simply the spillover of His infinite exuberance for his own excellence’ (my emphasis, DG, p45). But the glory of God, which is manifested in all His attributes together, is eternal and will never pass away. So the glorious God of the Bible does not need to preserve or add to his glory. Humans do not need to build up God’s glory. Glory is part of God’s self-existence; a manifestation of who He is. God’s glory is revealed in Creation. ‘The heavens declare the glory of God’ (Psalm 19.1). His glory is revealed in the Cross of Christ. Jesus said, ‘Now is the Son of man glorified, and God is glorified in him. If God be glorified in him, God shall also glorify him in himself, and shall straightway glorify him’ (John 13.31-32). So the glory of God stands forever, and does not need to be preserved. For Piper to imply that God’s glory needs to be preserved is a serious error. ‘Man’s chief end is to glorify God, and to enjoy Him forever’ (my emphasis). Piper has distorted this statement by replacing the ‘and’ with ‘by’, so: ‘The chief end of man is to glorify God by enjoying Him forever’. Piper is actually proceeding on a false premise when he rewrites this statement. 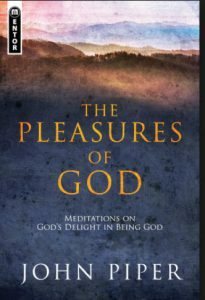 Piper’s bold re-writing of the Confession statement suggests that God needs our enjoyment of Him, or our satisfaction in Him, in order to maintain His glory. Piper’s self-absorbed god is not just a hedonist he also needs our help to keep His glory intact. Piper believes that both God and man need to pursue hedonistic pleasure. Thus he tries to find a divine command to support the search for personal pleasure. But the God of Scripture is not ultimately focused upon His own happiness as Piper would like us to believe. God is chiefly concerned with whom His glory is given. God is not concerned with gaining an emotional high by indiscriminately spreading His glory around. God is not like human beings who have shared the bridal chamber of their hearts with numerous lovers they have in the world. God will not share His glory with another whom He has not first loved. What’s more, the love God has for the elect is a foreknown love that resides in His heart before the foundation of the world was established. If God was focused upon His own happiness with His glory as the object of His affection, He would be a capricious God. Ultimately God is focused on His own glory, but not for the purpose of emotional jubilations or self-glory-preservation. If God’s glory could be diminished He is not God. If God’s glory could be diminished, He would ultimately be focused upon self-preservation in the same manner as human beings. Since God’s glory cannot suffer loss, His immediate focus of concern is not the preservation of His glory, but the demonstration of His glory through what He has created, and though the holy, blameless lives of His redeemed people, purchased with the blood of Christ (Robert Culver, Systematic Theology, p161). The implications of Piper’s self-absorbed god are massive in relation to God’s work of redemption, salvation, and restoration. For example, Paul writes in the epistle to the Romans that God’s goal in redemption is to make every believer conformed to the image of His Son, who is the exact representation of God (Colossians 1.15-20; Hebrews 1.3), and with the end result of their individual glorification in the likeness of God’s own glory (Romans 8.29-30). Logically it stands, if God is most concerned about the enjoyment of His glory alone, then every glorified believer conformed to the image of His Son will be most concerned about the enjoyment of their glory alone, not God’s. ‘If God were not infinitely devoted to the preservation, display, and enjoyment of His own glory, we could have no hope of finding happiness in Him’ (emphasis mine, DG, p31). Note the inconsistency of Piper’s statement. For if God were truly devoted to the preservation, display, and enjoyment of His own glory, we truly would have no hope of finding happiness in Him because we would find it only in ourselves. The clear teaching of Scripture communicates that God’s ultimate plan is directed towards the good of His people. For the Christian ‘all things work together for good to them that love God, to them who are the called according to his purpose’. God has purposed in eternity past that we who believe will be ‘conformed to the likeness of his Son’ (Romans 8.28-29). God’s consummate goal is the redemption, salvation, glorification of His people; so that His glory be forever displayed and enjoyed by those whom He has redeemed. That kind of concern flows from a selfless, loving, omniscient, omnipotent, and omnibenevolent God. Notice how I removed the word ‘preservation’. Is not a selfless god-centered persona the image Jesus Christ demonstrated in the gospels? So the focal point of each glorified believer is entirely fixed on the worship and exaltation of God for all eternity. ‘Let this mind be in you, which was also in Christ Jesus: Who, being in the form of God, thought it not robbery to be equal with God: But made himself of no reputation, and took upon him the form of a servant, and was made in the likeness of men: And being found in fashion as a man, he humbled himself, and became obedient unto death, even the death of the cross’ (Philippians 2.5-8). This text stands in complete opposition to Piper’s god—it deeply contradicts the notion of God being self-absorbed with happiness and it thoroughly discredits Piper’s philosophy of Christian Hedonism.